Every year, the offshoots of the popular sports games appear in autumn. Fifa is, of course, the dominant force in the field of sports simulations in Germany. However, as American football is getting more and more popular here, the Madden series also finds more and more fans. Now with Madden 18 appears the new offshoot of the football series. Is this just another year's squad update, or is there more behind it? Madden 18 focuses mainly on two major innovations: Firstly, the series, just like Fifa, has switched to the Frostbite engine from Dice. In addition, Madden 18 delivers a story mode with "Longshot", where you follow the path from Quarterback Devin Wade to the NFL. Fans of last year's Fifa recognize parallels to "The Journey", but this is not quite true. Longshot feels more like a playable movie. The new Frostbite engine, which can really present its strengths in the many dialogues, plays a big part in this. The facial expressions are realistic and comprehensible, helping to make Longshot an authentic experience. The protagonist Devin Wade and his best friend since childhood Colt Cruise have been staged really coherently and could come one-by-one from one of the many sports dramas. The story of Devin Wade is really interesting to pursue, even though she is a little stereotypical: the quarterback is blessed with unique talent, driving a victory at the high school and college after the other. After the death of his father, who was both his football coach since his childhood and his last remaining parent, his life collapses. He loses his fun at the football and retires after a disastrous failure in a finals game from football. Only in the army does he rediscover his love at the football and decides to try again with the football after his military service. During an NFL-organized selection league, where young players can present their abilities in various football exercises, he receives an invitation from a producer to the reality TV series "Longshot". In this series, four young talents fight for the invitation to the NFL-Draft and thus also the dream to rise to the football pro. In Longshot, the story and the interaction of the characters are compared to The Journey. The time you really freely play on the square is really manageable. This is not a bad thing, however, since this also provides a truly film-like experience. The appearance of some football sizes, e.g. Quarterback legend Dan Marino, who prepares you as a mentor for the NFL, round off the overall result again. The Frostbite engine also contributes to the success of the story mode. Mimic and general movements of the persons are so more realistic and create an authentic experience in the cutscenes. Also in the regular game, everything looks a bit better and more realistic. The audience looks fantastic and, together with the soundscapes, gives the impression that you are really in the Super Bowl. Furthermore, the innovations are rather small. 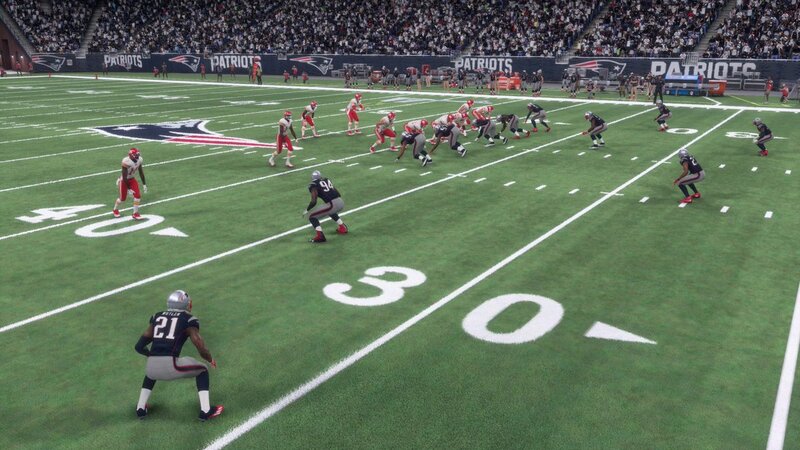 The franchise game mode and the popular popular Ultimate team mode continue to work perfectly and have the opportunity to tie you up with their playing depth for months on the pad. However, you are looking for great innovations here in vain. A new addition to the game is Madden 18, but with the three different game variants Arcade, Simulation and Kompetitive. By this innovation, Madden 18 is supposed to reach every player. Do you want to play a round round Madden against your friends in the evening? Then the arcade mode is the right choice. Spectacular moves and games are the focus here. There are fewer penalties, and everything is a bit easier. Ideal to play a round against friends who may not be familiar with the very complex sport of American Football. If you decide for Simulation mode, you get the full Madden cost. With real-world team strengths and moves, you get the authentic game experience any football fan desires. In competitive mode, you can only decide your skills at the pad. The occurrence of random events has been reduced so you can only rely on your skills as a virtual quarterback. Each of these three game modes have advantages and bring in their way a lot of fun, so that this innovation is definitely very welcome.